This past weekend I went up to my sister’s house for our planned “Hair Day”. Take note that when I say day I literally mean it took us ALLL DAY to complete both our heads! Now this could have been because when you get together with your sisters a lot of time is spent sitting and talking and eating followed by huge amounts of laughing. Orrrr it could be because we are both natural and both sporting tresses that fall past bra strap length! *whew* either way it was an amazing and lonnnnggg day. My Channy is a licensed beautician and truly gifted at her craft. Click here to see her instagram and check out her work and then contact her for your next sew-in/cut/color! She does it all! Channy opted to take down her sew-in and flat iron her hair. I started by detangling her hair using coconut oil to loosen the shedded hair then follow with the conditioner of her choice to act as a deep conditioner. It took a good two hours minimum to detangle but it was time well spent! Please! Please! Please! Be patient and gentle when detangling after wearing a sew-in for a long period of time. Your hair will thank you for the nourishment and you will be happy that you haven’t ripped out all of the length you grew in the past few weeks. After about another hour or so (while she braided my hair as prep for a new install) I washed and then conditioned her hair while in the twists using the kit pictured below. I have tried this kit and I did like the results. I have only used it once and my curls did revert once I washed my hair. Can I tell you every single chemical in this kit and what active ingredients are actually keeping the hair straight??……. No, no I can not. All I can say is that it worked for me and it worked for my Channy. After the recommended 20 minutes she blew her hair dry and then our sister Alena straightened it with a flat iron. Guess what ?? Alena is a licensed beautician too! (Aren’t I a favored little lady to have all these beauticians right at my fingertips!) 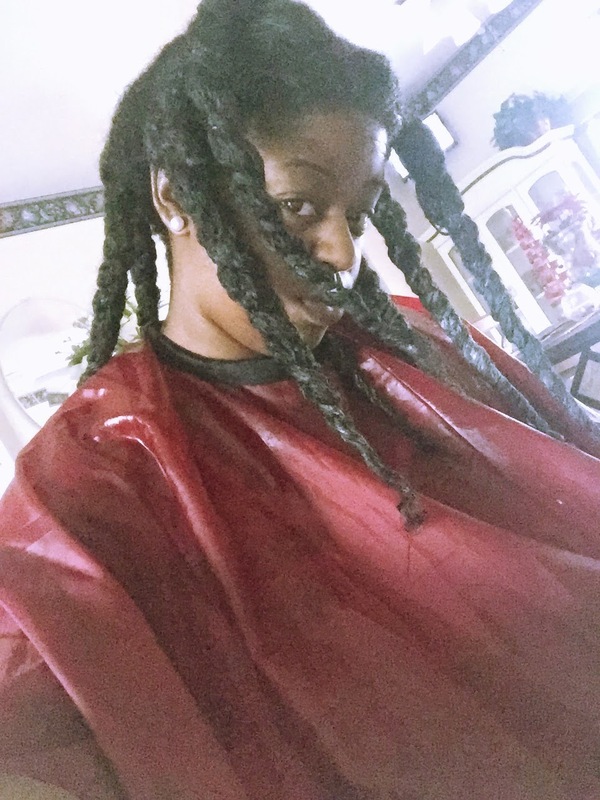 Click here to see her instagram where she posts her DIY’s and natural hair styles as well! I decided to put my hair away as I had been wearing a bun for the past few weeks and then clip-ins. I wanted a break from my hair for the holidays. Channy braided my hair, sewed in the wefts and then styled the extensions for me! Don’t you just love sitting in the chair rather than having to reach up and do your own hair?! I know I do !!! We made it into the church house!! From left to right : myself, Channy, and my sweet Chelz! What styles do you tend to lean on during your hair journey? Love this! I hope to be at these lengths again very soon! HI nette!!!! Thanks for visiting!! I know you will!! Beautiful, healthy hair. I wish my sister and I could do hair like y'all, lol. I will be trying this kit, been looking for something to help manage my hair when I do wear it out. No problem, I hope it works for you!! Thanks for visiting the blog! !